I don’t know about you, but I like the concept of burning more calories after I’m done exercising. Talk about a bonus! Say goodbye to steady cardio and embrace a whole new fitness philosophy centered around HIIT. Watch how quickly your body begins to transform. There are certain fitness myths that just won’t die. I’ve seen many people waste their time and effort on this one. Just because you’re giving your body a break from grains this week doesn’t mean your dinner will be rice-less. 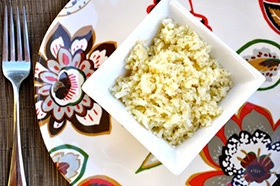 Fresh, organic cauliflower makes the perfect base for grain-free rice. 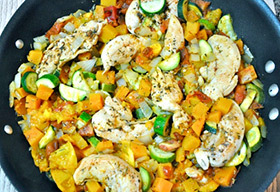 Serve with a side of lean meat and a fresh garden salad for a low carb, real food meal. How quickly does a week fly by? Pretty fast, right? When you decide to eat only real food for 7 days you will be amazed at the positive improvement that you feel and see in your body. Do this challenge for yourself. In one short week you could be in the same, worse, or you could be leaner and excited. 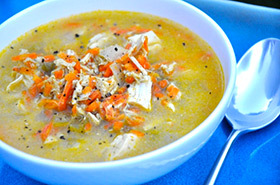 This chicken soup recipe is made without added carbs like noodles or potatoes. It’s filled with fiber, protein and lots of delicious flavor. Enjoy this on a cold winter day. Resources are available to help you determine the healthiest fast food choices. Being ignorant of the facts is one of the main reasons you’ll wind up making unhealthy food choices. Better yet, download a mobile phone app with nutrition information by restaurant, and when you must go out, choose accordingly!